Since the beginning of the year a significant milestone for the future of digital radio in Europe was made when the EBU recommended DAB+ as the future for European digital radio. During the 2013 Digital Radio Summit in Geneva, Switzerland (13 February), the European Broadcasting Union (EBU) released Recommendation R138. 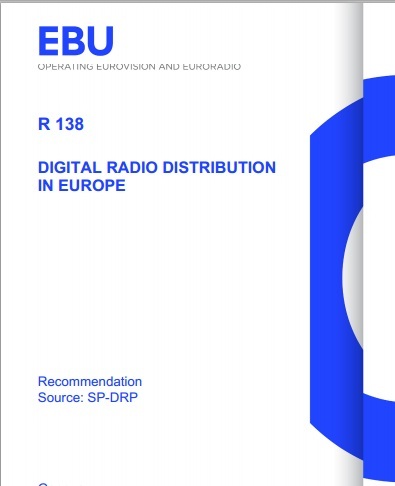 This technical recommendation which comprises of the first agreement of EBU members on digital radio distribution was approved by the EBU Technical Committee and was released to encourage more digital radio programming across Europe. Recommendation R138 was presented by the chair of the EBU’s Strategic Program on Digital Radio Platforms, Javier Sánchez Perez. The recommendation says there must be adequate planning to ensure digital solutions for all radio services. Enhancements, it says, including accompanying text, images and program guides should be a part of digitization, and hybrid services, like the RadioDNS system, that utilize additional web-delivered content, should also be rolled out. The full recommendation can be downloaded here. This entry was posted on May 4, 2013 by WorldDAB in Digital Radio Rollout, Europe, Events, Feature Article, Marketing, Spectrum and Regulation, Technical News.